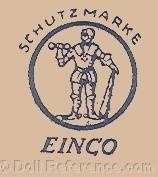 Eisenmann was founded in 1881 in both Furth, Germany and London, England by Gabriel & Josef Eisenmann as an export business for fancy household wares, about 1895 they added dolls and toys. Their address in 1912 was 46, Basinghall, London, EC. 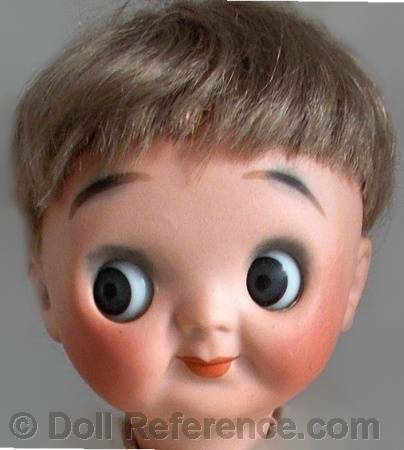 Prior to 1905 records indicate Eisenmann made or sold a type of London Rag Doll with a wax overlay and painted features. Examples do not appear to have survived today or that can be attributed to Eisenmann. 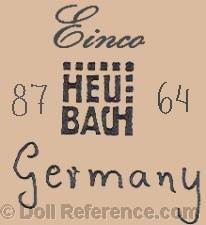 Around 1911 Eisenmann began to produce and distribute bisque head dolls made for them by Gebrüder Heubach. Shown left; ca. 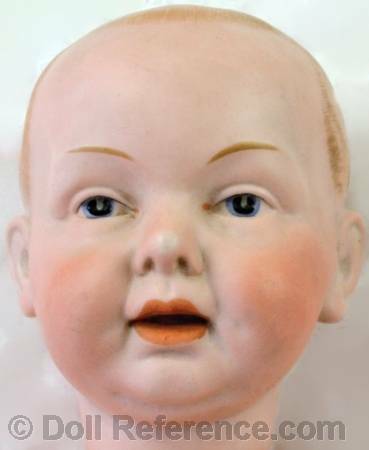 1912 Eisenmann bisque domed head baby doll, 15" tall, painted facial features, open mouth, composition bent limb jointed baby body, doll mark Einco 2 Germany. Josef Eisenmann of the London branch was referred to as the "King of the Toy Trade". 1908 Little Pet, Butterfly Series dolls or toys made partly of metal, 1911 Kiddieland, 1912 Beaky-Ba, Hugmee, Kwacky-Wack, Toddles, 1914 Bunny Hug, Floatolly dolls. In the 1920's Eisenmann's London branch were the agents for Louis Amberg and Mittelland. 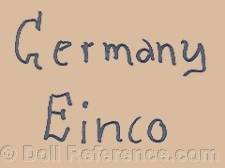 By 1925 Eisenmann advertised Lenci like cloth dolls, Mama dolls and baby dolls.